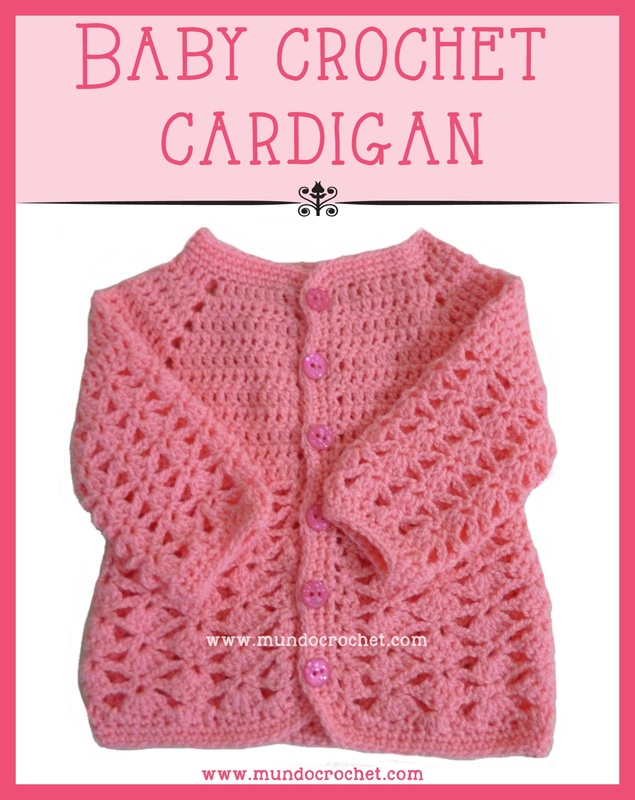 In this new post, I want to show you this baby cardigan crocheted for my little niece Joaquina, that was born a month and a half ago. 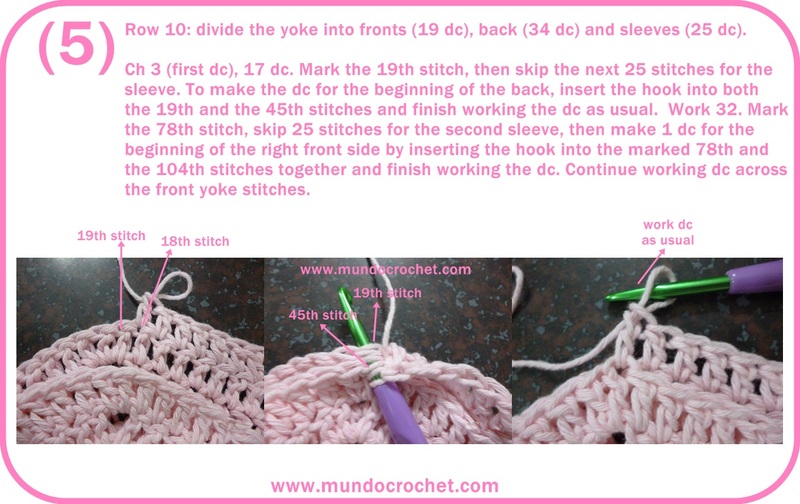 First you crochet the yoke and then the body. It´s a very feminine and colorful project. 1 dc in the 5th ch from hook, 1 dc in each of the next 7 ch. 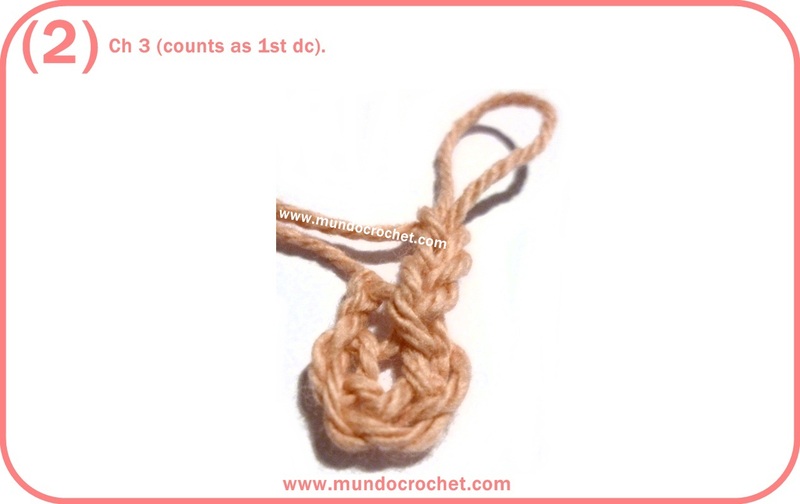 Total: 9 dc (these stitches will form the left front side). Ch 2, 9 dc in the next 9 ch. Total: 9 dc (left sleeve). Ch 2, 18 dc in the next 18 ch. Total: 18 dc (back). Ch 2, 9 dc in the next 9 ch. Total: 9 dc (right sleeve). Ch 2, 9 dc in the next 9 ch. Total: 9 dc (right front). Row 2) Ch 3 (counts as first dc), 1 dc in each stitch of the previous row. 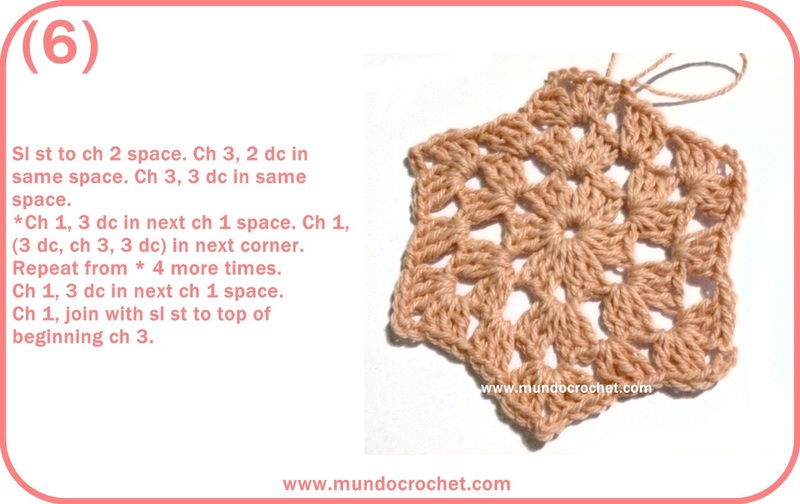 In the ch 2 spaces crochet (1 dc, ch 2, 1 dc). Repeat until end. Total: 62 dc. Rows 3 to 9) Repeat row 2. Total 70, 78, 86, 94, 102, 110 and 118 dc each. Row 10) Ch 3 (counts as first dc), 1 dc in each stitch of the previous row. 2 dc in the ch 2 spaces. Repeat until end. Total: 126 dc. 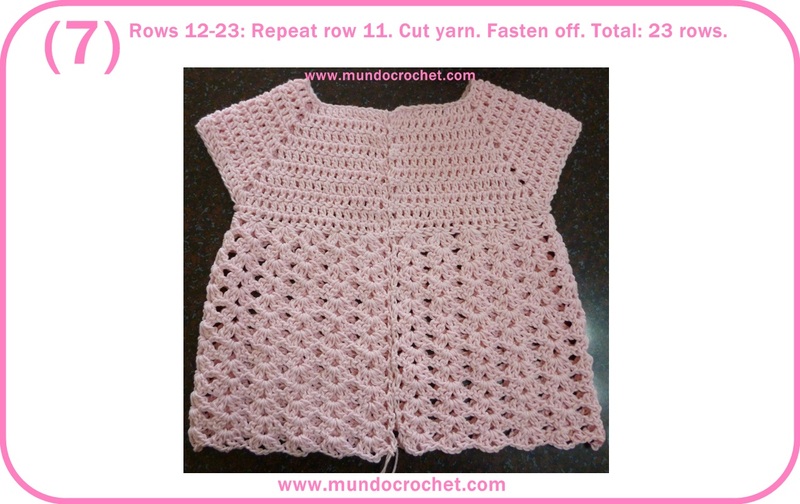 In the row 11 we will divide the yoke into: fronts (18 dc each), sleeves (27 dc each) and back (36 dc). 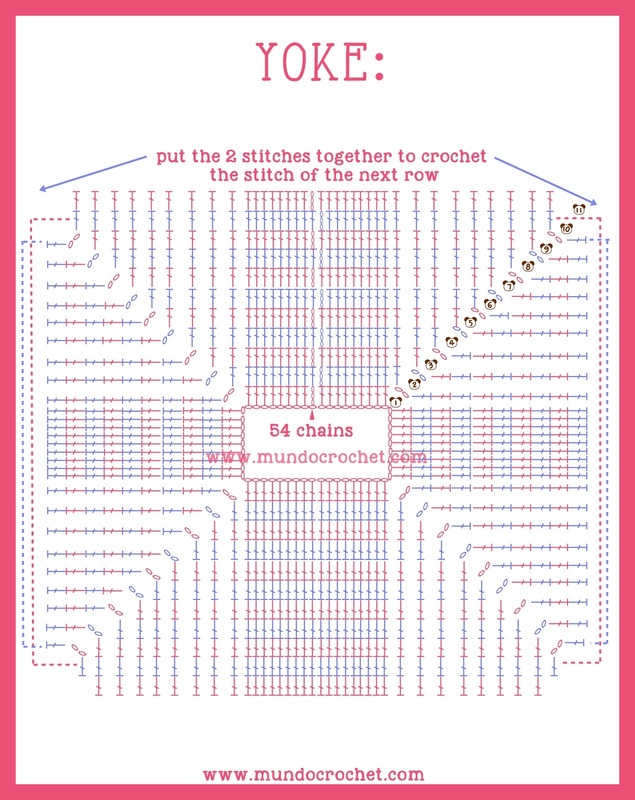 Row 11) Ch 3 (counts as first dc), 1 dc in the next 16 stitches. Mark the 18th stitch, skip the next 27 stitches (sleeve). To make the dc for the beginning of the back, insert the hook into both, the 18th and the 46st, and finish working the dc as usual. 34 dc in the next 34 stitches. Mark the 81st stitch, skip the next 27 stitches (sleeve). To make the dc for the beginning of the right front, insert the hook into both, the 81st and the 109th, and finish working the dc as usual. 17 dc in the next 17 stitches. Total: 70 dc. 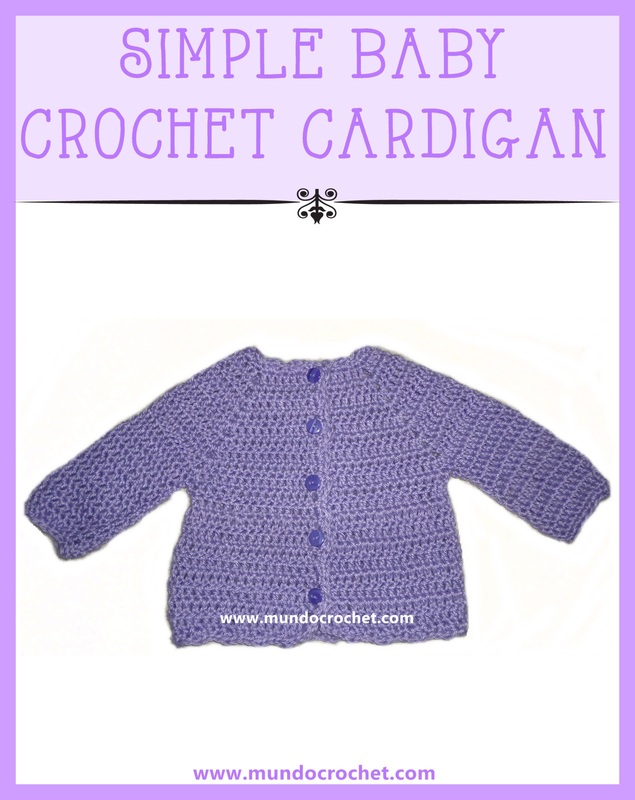 You can see the tutorial in the post of the Little girl crochet cardigan. Row 12) Ch 3 (counts as 1st dc of the row). 1 dc in the 4th st. *Ch 2, skip 3 st, (1 sc, ch 3, 1 sc) in the 4th st. Ch 2, skip 3 st, 3 dc in the 4 th st. Repeat from * until end. 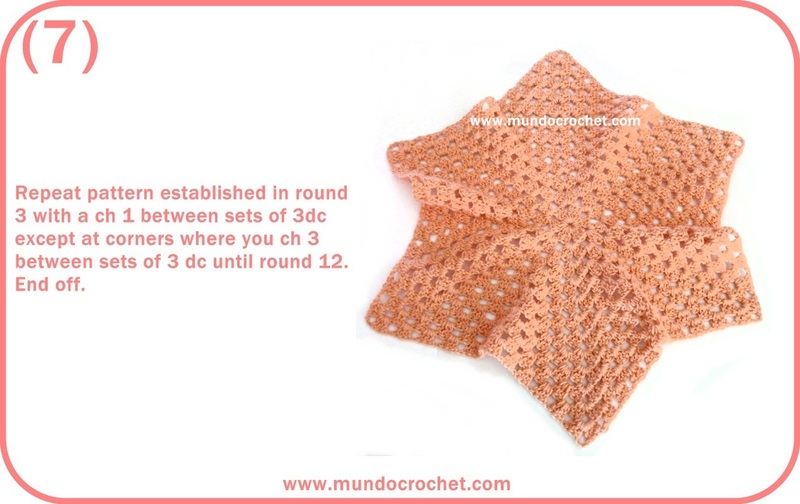 In the last st crochet 2 dc instead of 3. 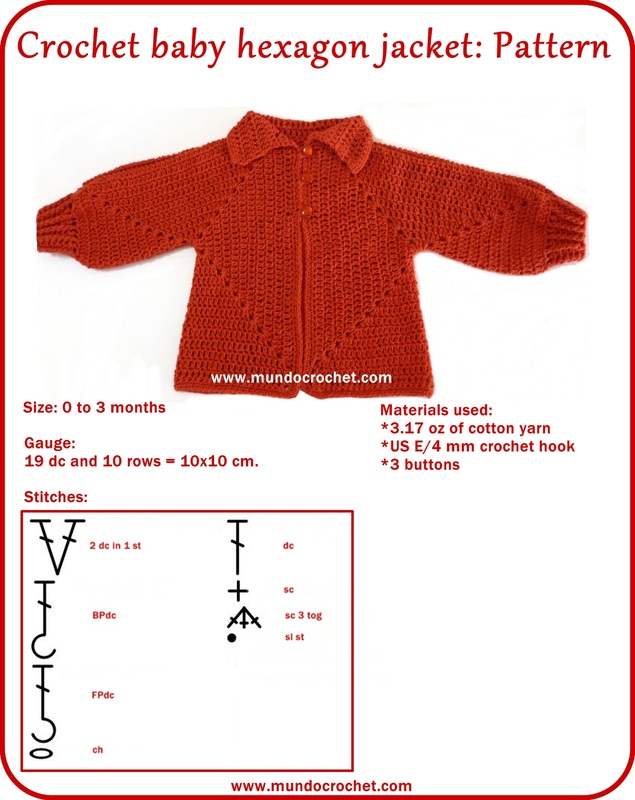 Often the fantasy stitch is a multiple of a number that does not match with the number of stitches that you have in the yoke, so instead of 2 dc you finish with (1sc 3ch 1sc). You need 4 more stithes to finish the row with 2 dc. 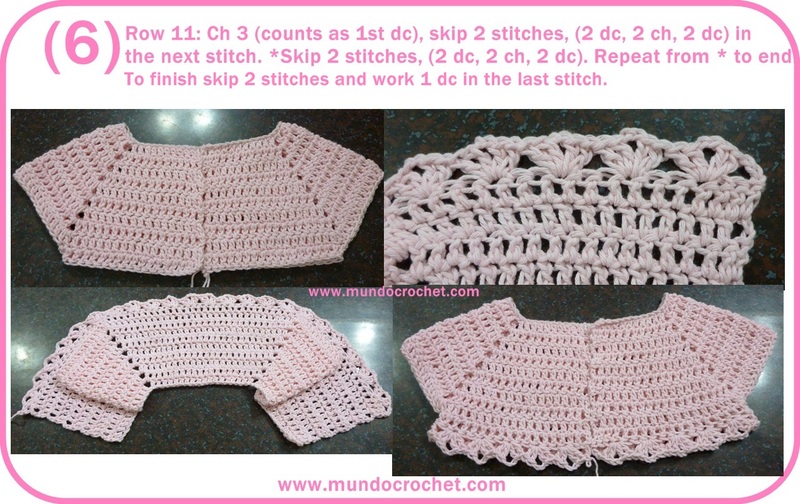 To do that you have to crochet the row 12 skipping 2 stitches instead of 3 between the 3 dc and the (1sc 3 ch 1sc) 4 times. The rest of the row continue skipping 3 stitches. You can do this at the beginning, end or middle of your work (I prefer 2 times at the beginning and 2 at the end). Row 13) Ch 1, (1 sc, ch 3, 1 sc) in the 1st st. *Ch 2, 3 dc in the ch 3 space, ch 2, (1sc, ch 3, 1 sc) in the 2nd dc of the previous row. Repeat from *a until end. 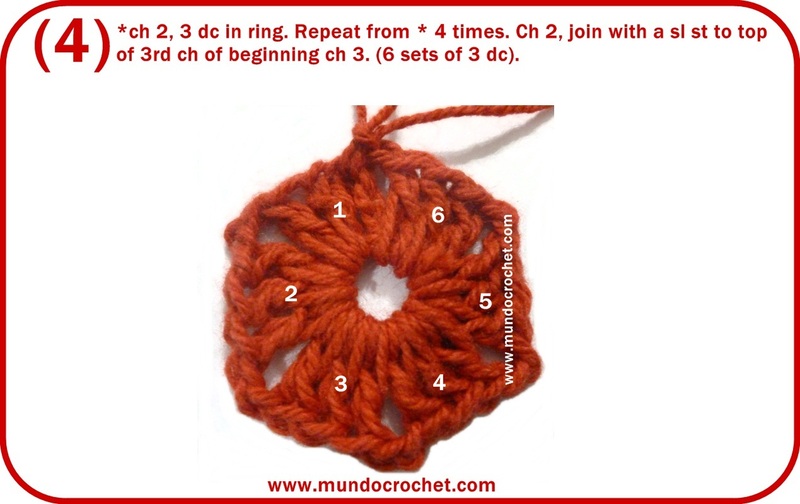 Crochet the last (1sc, ch 3, 1 sc) group in the last st of the row. Row 14) Ch 3 (counts as 1st dc of the row). 1 dc in the ch 3 space of the previous row. *Ch 2, (1 sc, ch 3, 1 sc) in the 2nd dc. Ch 2, 3 dc in the ch 3 space. Repeat from * until end. 1 dc in the last ch 3 space, 1 dc in the last st of the row. Row 15) Ch 1, (1 sc, ch 3, 1 sc) in the 1st st. *Ch 2, 4 dc in the ch 3 space, ch 2, (1sc, ch 3, 1 sc) in the 2nd dc of the previous row. Repeat from *a until end. 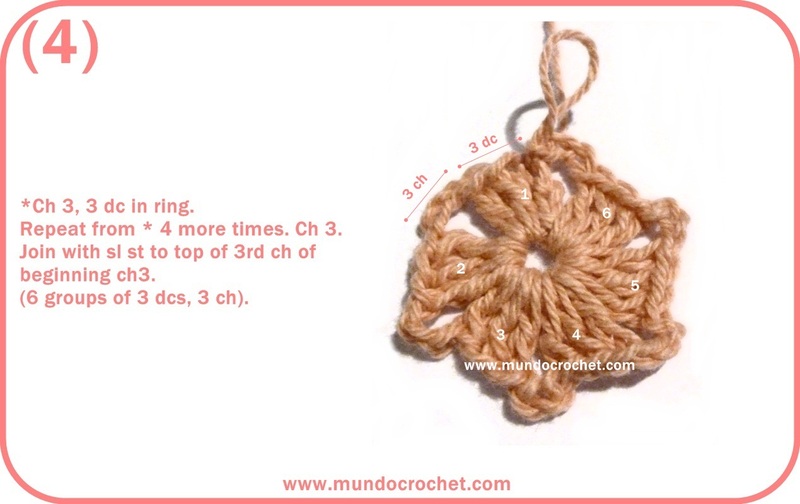 Crochet the last (1sc, ch 3, 1 sc) group in the last st of the row. Row 16) Ch 3 (counts as 1st dc of the row). 2 dc in the ch 3 space of the previous row. 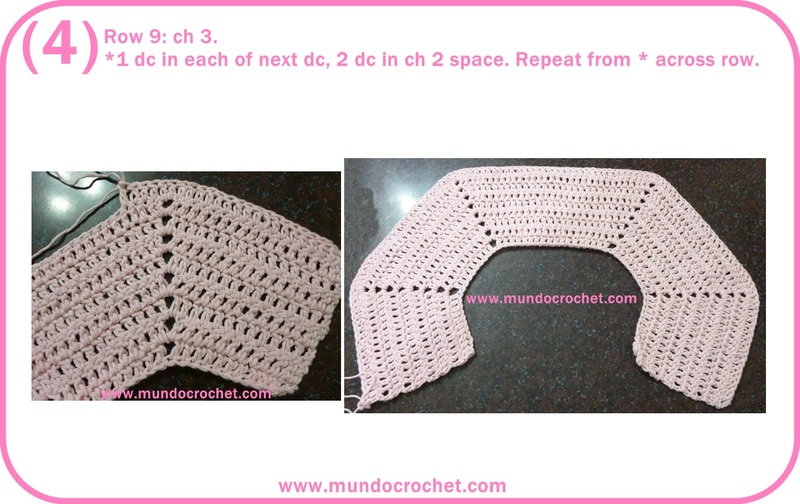 *Ch 2, (1 sc, ch 3, 1 sc) between the 2nd and the 3rd dc of the previous row. Ch 2, 4 dc in the ch 3 space. Repeat from * until end. 2 dc in the last ch 3 space, 1 dc in the last st of the row. Row 17) Ch 1, (1 sc, ch 3, 1 sc) in the 1st st. *Ch 2, 5 dc in the ch 3 space, ch 2, (1sc, ch 3, 1 sc) between the 2nd and the 3rd dc of the previous row. Repeat from *a until end. 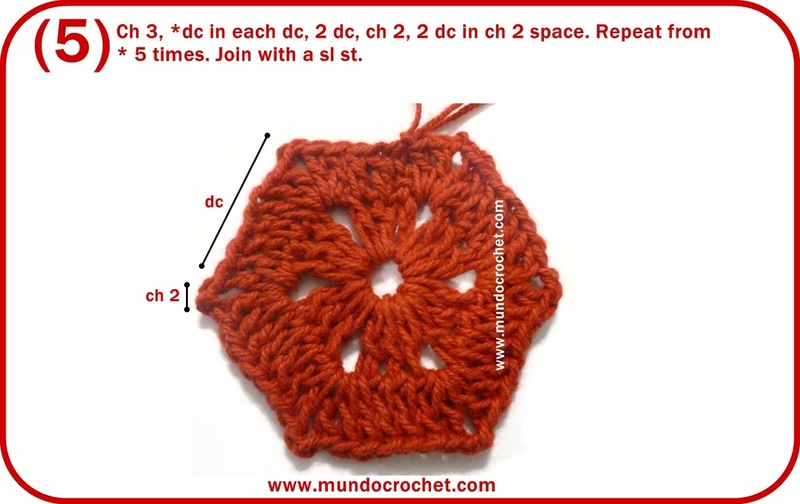 Crochet the last (1sc, ch 3, 1 sc) group in the last st of the row. Row 18) Ch 3 (counts as 1st dc of the row). 2 dc in the ch 3 space of the previous row. *Ch 2, (1 sc, ch 3, 1 sc) in the 3rd dc of the previous row. Ch 2, 5 dc in the ch 3 space. Repeat from * until end. 2 dc in the last ch 3 space, 1 dc in the last st of the row. Row 19) Ch 1, (1 sc, ch 3, 1 sc) in the 1st st. *Ch 2, 5 dc in the ch 3 space, ch 2, (1sc, ch 3, 1 sc) in the 3rd dc of the previous row. Repeat from *a until end. 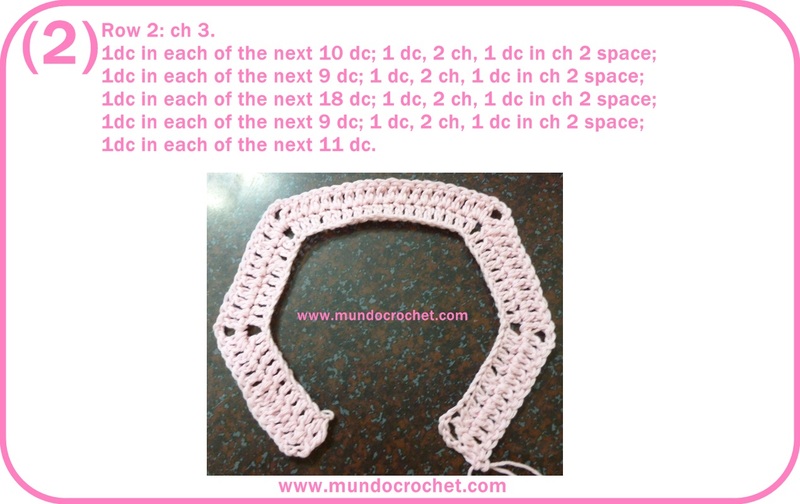 Crochet the last (1sc, ch 3, 1 sc) group in the last st of the row. Rows 20 to 23) Repeat rows 18 and 19. Row 24) Ch1, 2 sc in the ch 3 space, *1 dc, 1 hdc in the ch 2 space, skip the 1st dc of the shell , 3 sc in the next 3 st, skip the last dc. 1 hdc, 1 dc in the ch 2 space, 1 sc in the ch 3 space. Repeat from * until end. 2 sc in the last ch 3 space. On the sides: 1 sc in one row, 2 sc in the next. When you reach the neck: 2 sc in the 1 st st, 1 sc in the next st. 2 sc in the last st of the neck. Sl st in the 1st st of the row. Row 25) Ch, 1 sc in each st of the previous row. 2 sc in corners. Sl st in the 1st st of the row. Row 26) Repeat row 25. Row 11) Ch 3 (counts as 1st dc of the row). 2 dc in the 4th st. *Ch 2, skip 3 st, (1 sc, ch 3, 1 sc) in the 4th st. Ch 2, skip 3 st, 3 dc in the 4 th st. Repeat from * until end. Sl st in the 1st st of the row. Row 12) Ch 1, (1 sc, ch 3, 1 sc) in the 1st st. *Ch 2, 3 dc in the ch 3 space, ch 2, (1sc, ch 3, 1 sc) in the 2nd dc of the previous row. Repeat from *a until end. Sl st in the 1st st of the row. Row 13) Ch 3 (counts as 1st dc of the row). 2 dc in the ch 3 space of the previous row. *Ch 2, (1 sc, ch 3, 1 sc) in the 2nd dc. Ch 2, 3 dc in the ch 3 space. Repeat from * until end. Sl st in the 1st st of the row. Rows 14-20) Repeat rows 12 and 13. Row 21) Ch 1, 1 sc in the 1 st st and each st of the round. Sl st in the 1st st of the row. Rows 22-23) Repeat row 21. I hope you like it. 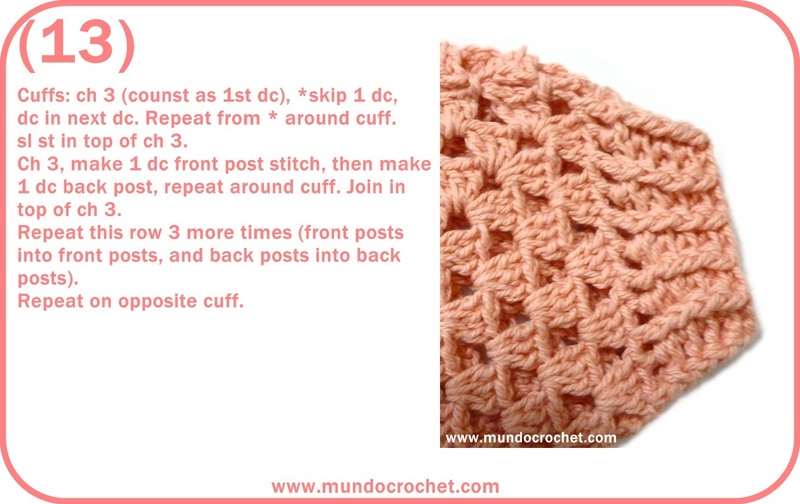 Don´t forget to send me the pictures of your projects using this pattern to soledad@mundocrochet.com o share them in the facebook page of Mundo Crochet! The best way to start the week: with a new project! 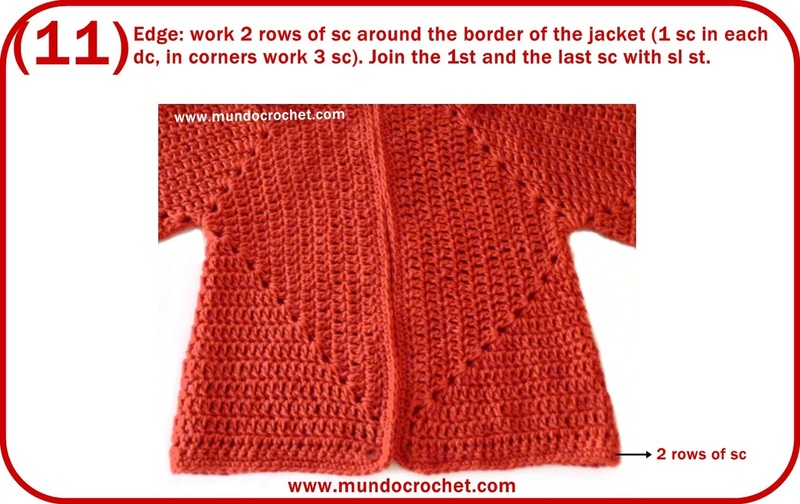 It´s been a while since I published a new pattern, so I’m happy to show you this cardigan or sweater. 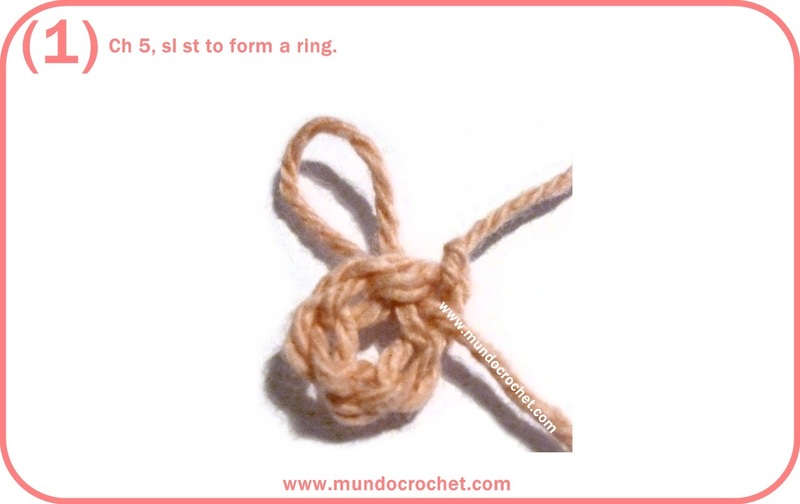 It´s a very simple and easy project, ideal for beginners and for those who want to crochet something for baby using very little material. 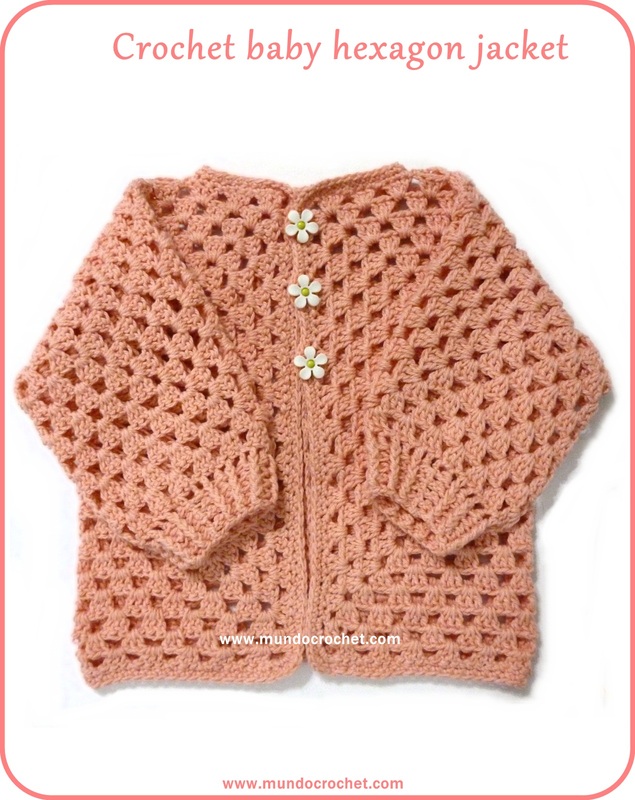 This cardigan is size 3 months old and is crocheted with double crochet. 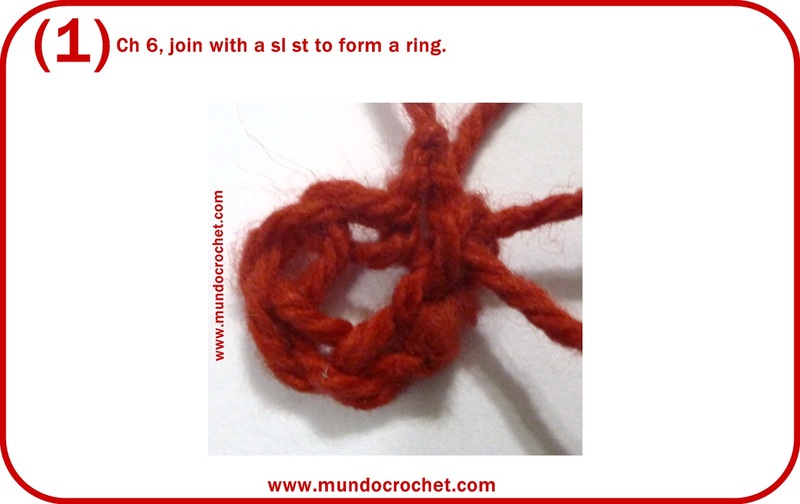 Ideal to practice how to crochet a yoke. 1 dc in the 5th ch from hook, 1 dc in each of the next 6 ch. 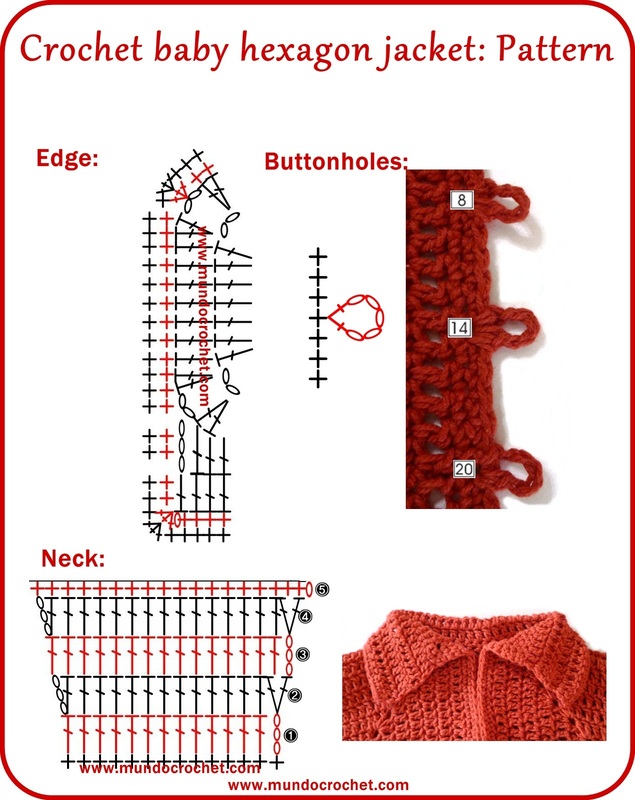 Total: 8 dc (these stitches will form the left front side). Ch 2, 8 dc in the next 8 ch. Total: 8 dc (left sleeve). Ch 2, 16 dc in the next 16 ch. Total: 16 dc (back). Ch 2, 8 dc in the next 8 ch. Total: 8 dc (right sleeve). Ch 2, 8 dc in the next 8 ch. Total: 8 dc (right front). Row 2) Ch 3 (counts as first dc), 1 dc in each stitch of the previous row. 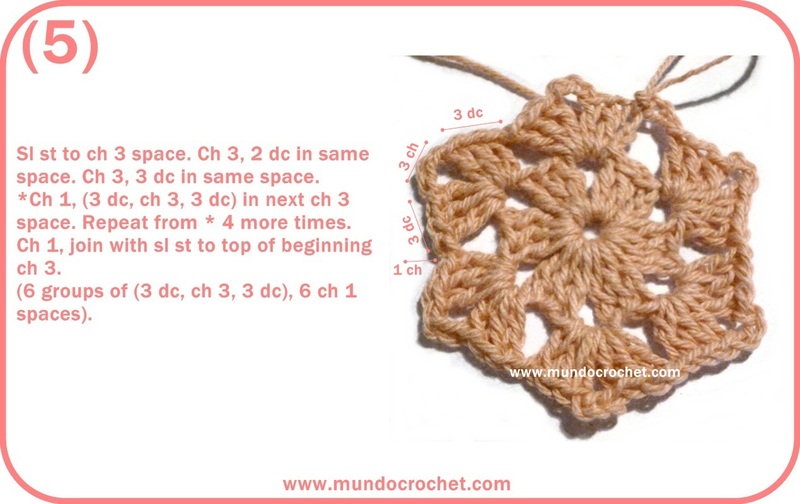 In the ch 2 spaces crochet (1 dc, ch 2, 1 dc). Repeat until end. Total: 56 dc. 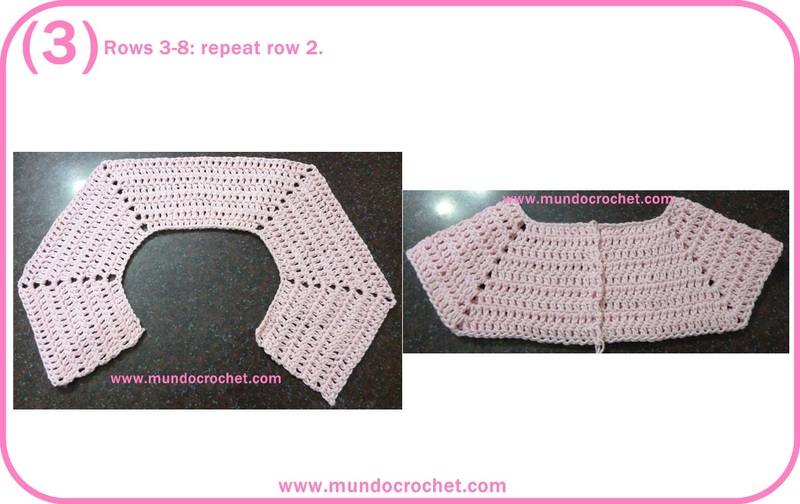 Rows 3 to 8) Repeat row 2. Total 64, 72, 80, 88, 96 and 104 dc each. Row 9) Ch 3 (counts as first dc), 1 dc in each stitch of the previous row. 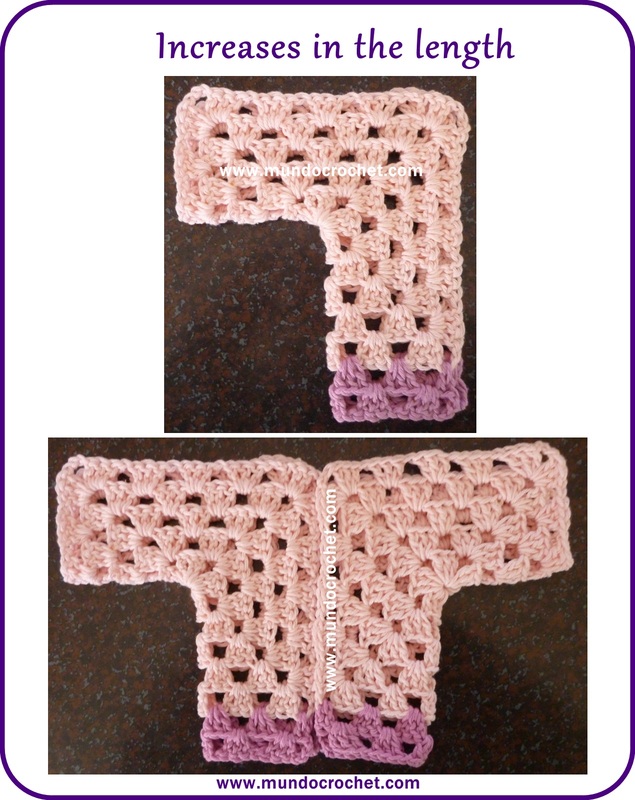 In the ch 2 spaces crochet 2 dc. Repeat until end. Total: 112 dc. 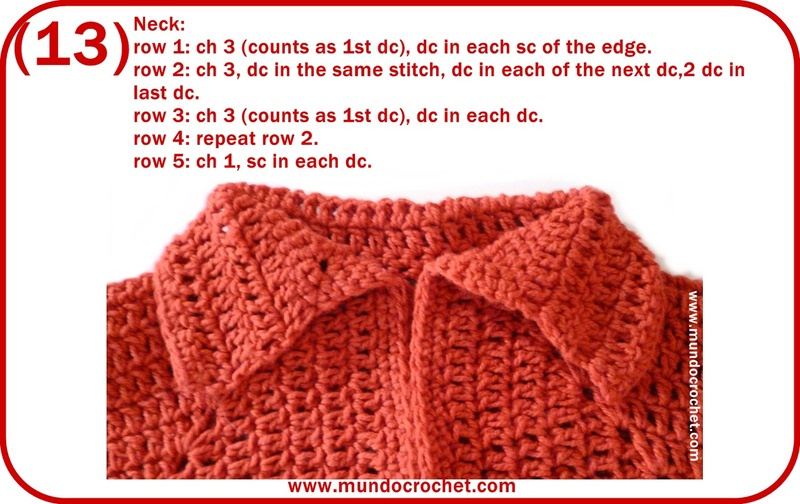 In the row 10 we will divide the yoke into: fronts (16 dc each), sleeves (24 dc each) and back (32 dc). 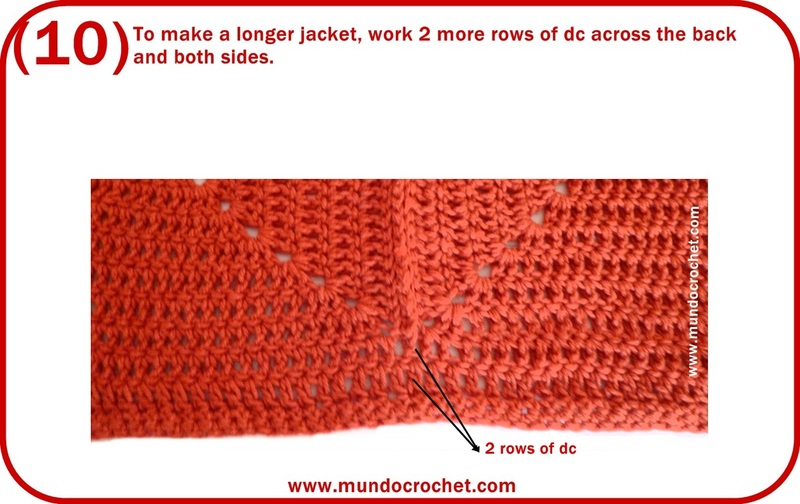 Row 10) Ch 3 (counts as first dc), 14 dc in the next 14 stitches. Mark the 16th stitch, skip the next 24 stitches (sleeve). To make the dc for the beginning of the back, insert the hook into both, the 16th and the 41st, and finish working the dc as usual. 30 dc in the next 30 stitches. Mark the 72nd stitch, skip the next 24 stitches (sleeve). To make the dc for the beginning of the right front, insert the hook into both, the 72nd and the 97th, and finish working the dc as usual. 15 dc in the next 15 stitches. Total: 62 dc. Row 11) Ch 3 (counts as first dc), 1 dc in each stitch of the previous row. Total: 62 dc. 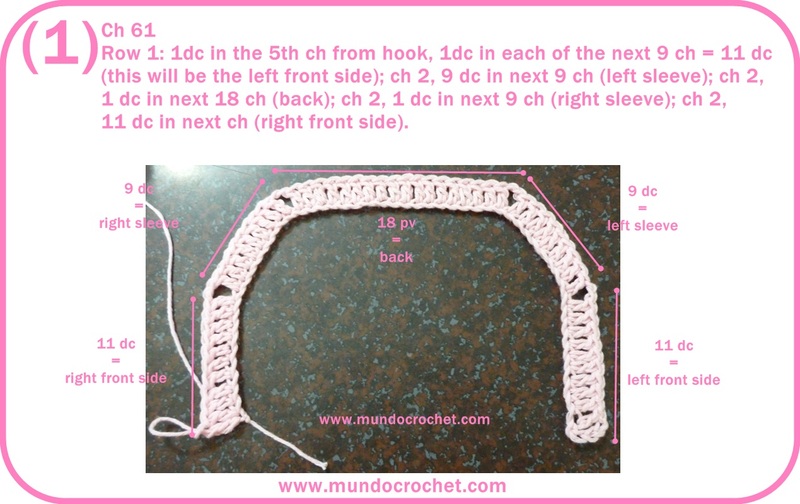 Row 12) Ch 3 (counts as first dc), 3 dc in the next 3 stitches. 2 dc in the 5th stitch of the row. 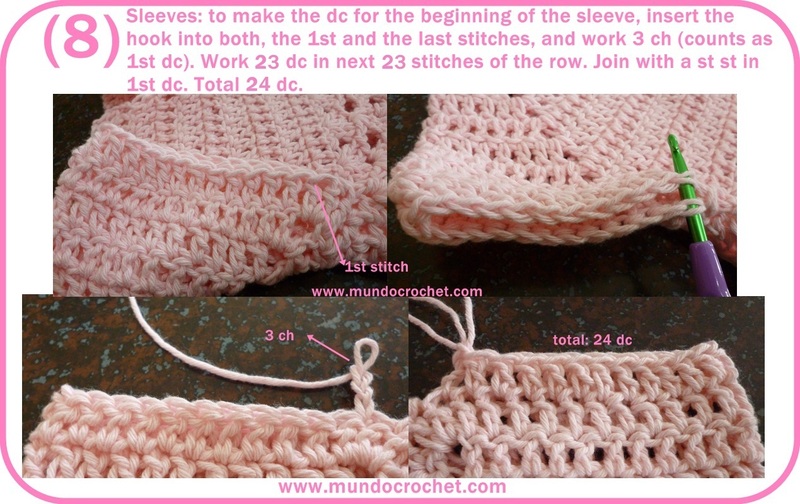 Continue with 4 dc in the next 4 stitches and 2 dc in the 5th stitch until end. Total: 74 dc. 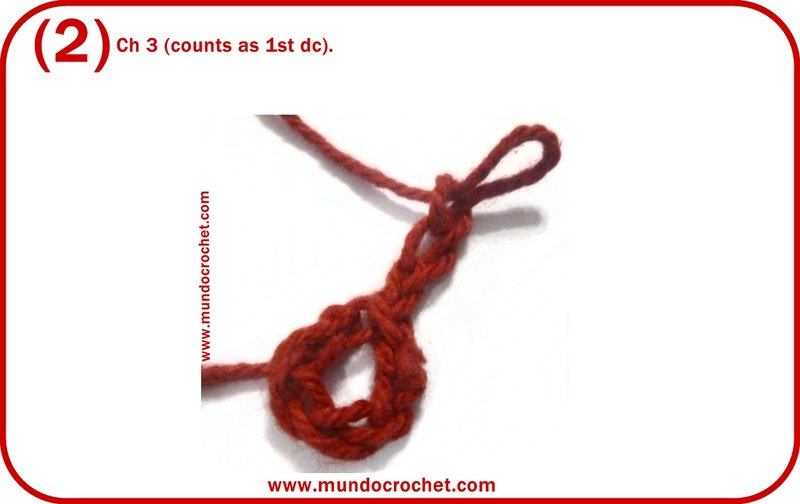 Rows 13 to 19) Ch 3 (counts as first dc), 1 dc in each stitch of the row until end. Total: 74 dc. 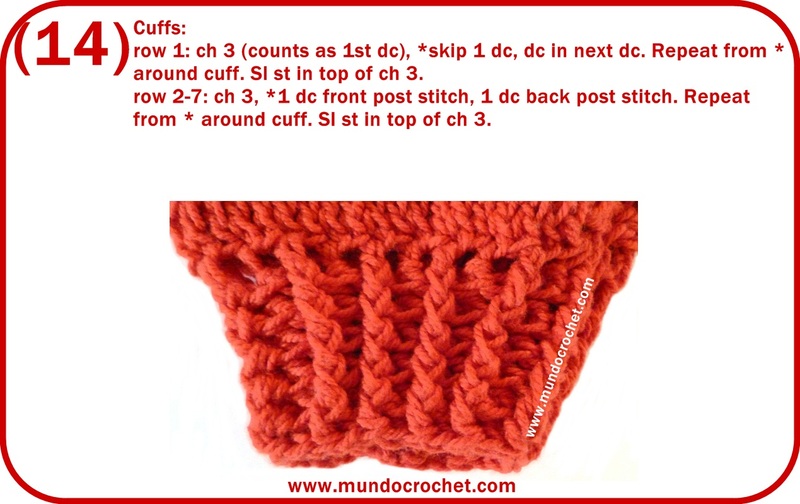 Ch 1, *1 sc in the same stitch, skip 1 st, 3 hdc in the next 3 st, skip 1 st* 1 sc. Repeat from *to* across fronts, back and neck. 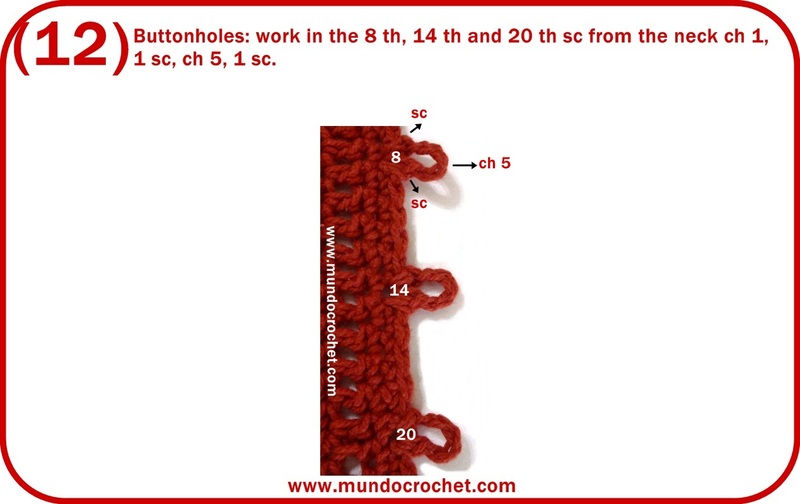 In the sides crochet 3 hdc in one row and 1 sc in the next (see chart). 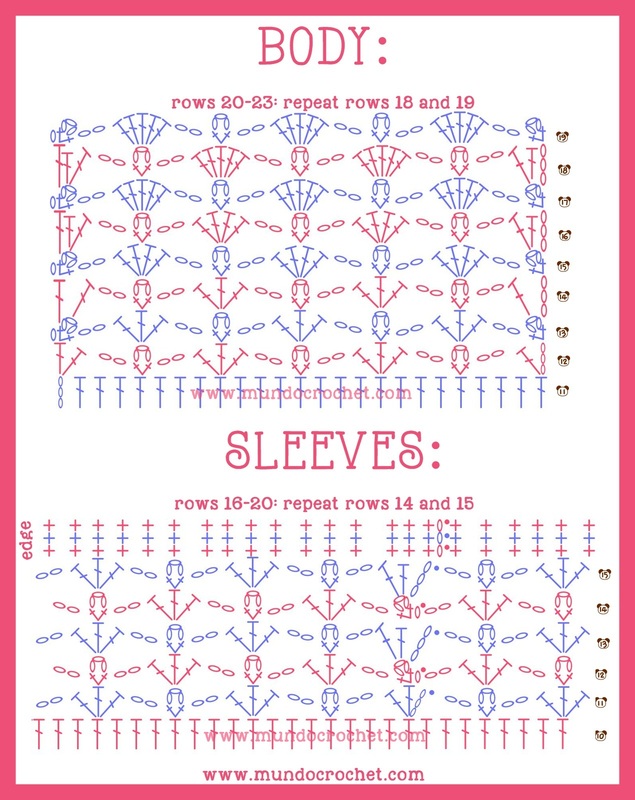 Row 10) To make the dc for the beginning of the sleeve, insert the hook into both, the first and the last stitch of the sleeve, and work 3 ch (counts as 1st dc). Work 22 dc in the next 22 stitches of the row. Join with sl st in the 1st dc. Total: 23 dc. 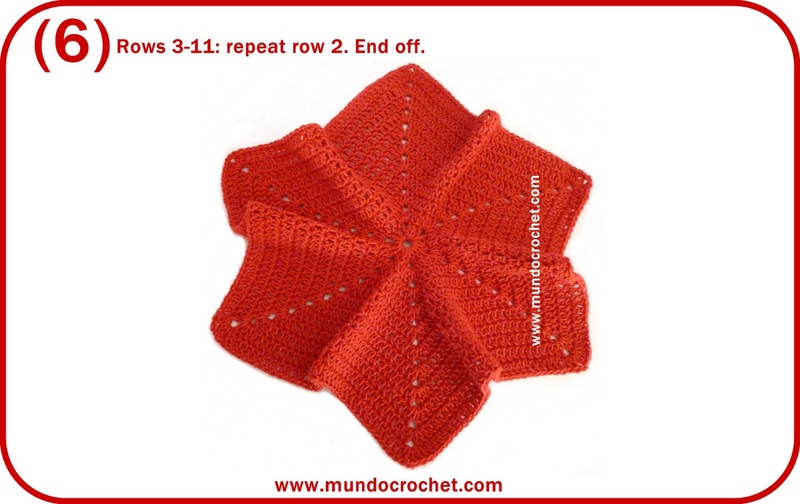 Rows 11 to 18) Repeat row 10. 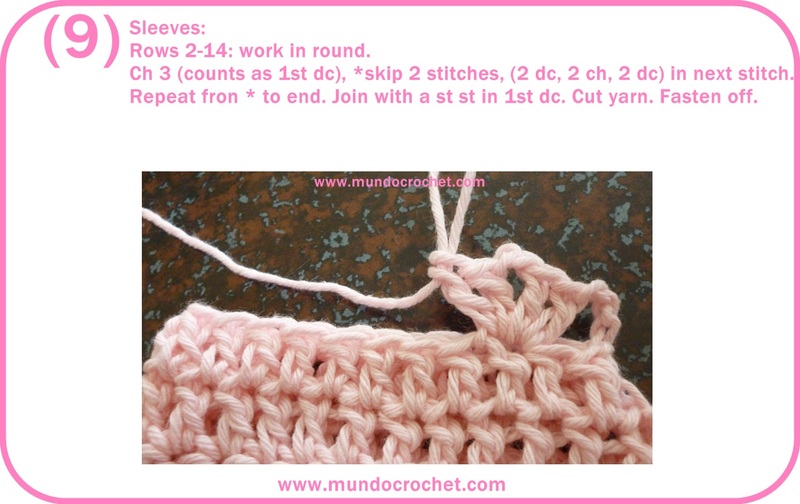 Ch 1, 1 sc in the same st. Continue working 1 sc in each stitch of the row. Join with sl st in the 1st sc. I hope you like it. 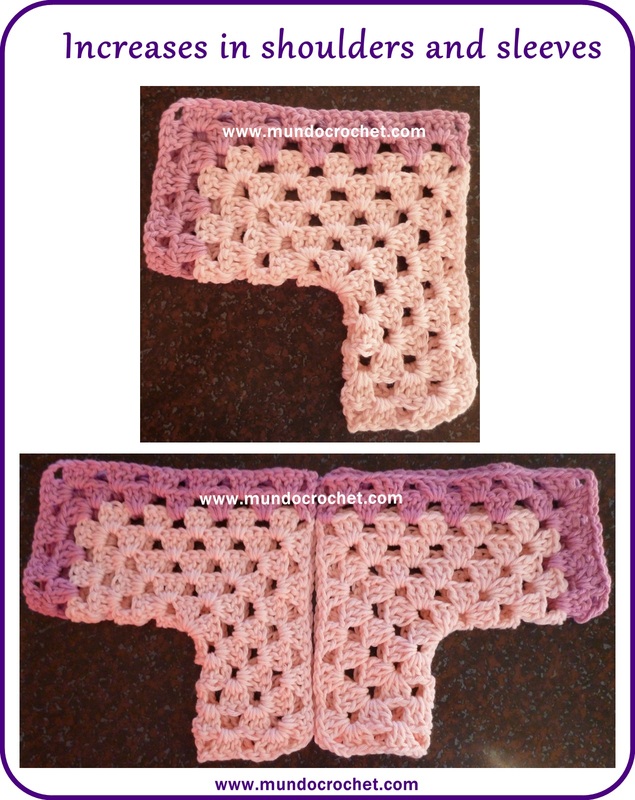 Don´t forget to send me the pictures of your projects to soledad@mundocrochet.com o share them in the facebook page of Mundo Crochet! 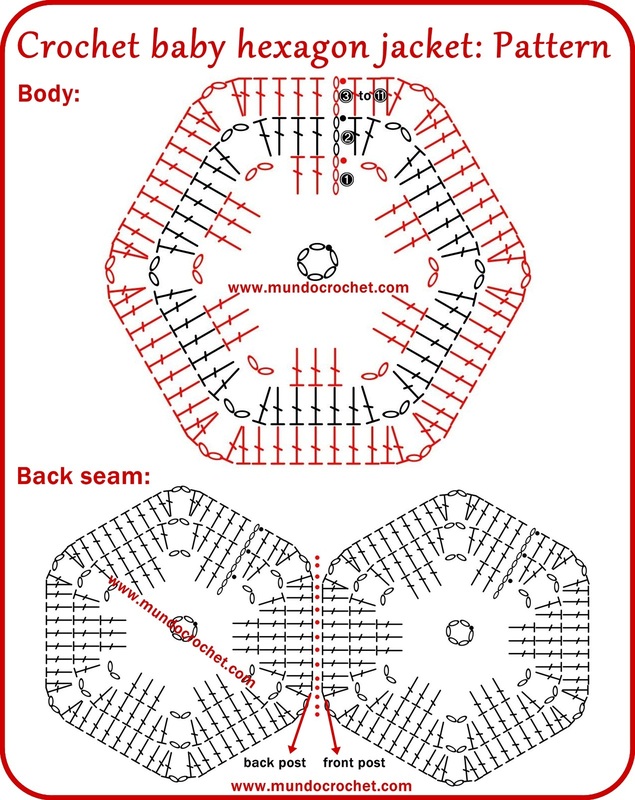 This post is for all those readers of the blog who consulted me about how to modify the size of the hexagon jacket. 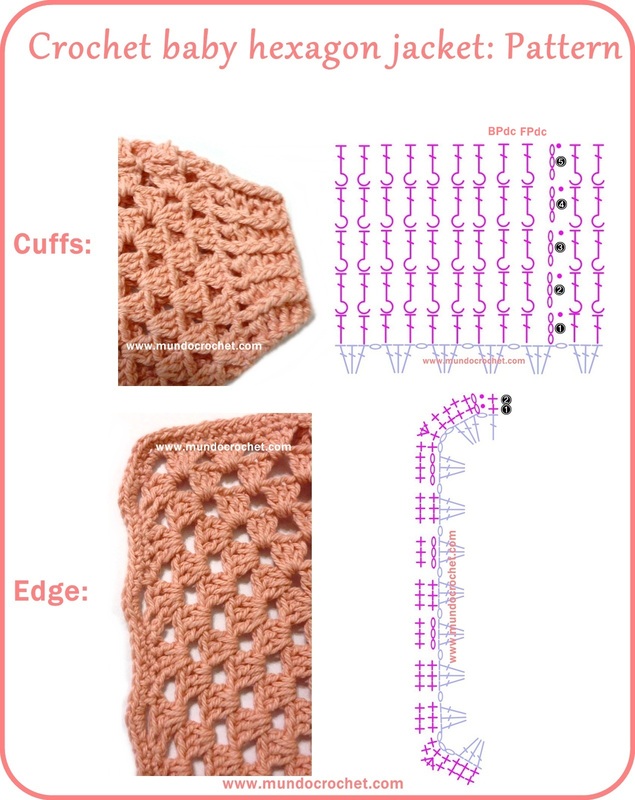 We know that if we add more rounds, we can increase the size of the hexagons, but there comes a point where we achieve the desired body size, but the sleeves are too wide , or vice versa, we have the desired width of the sleeves but the jacket is too narrow. 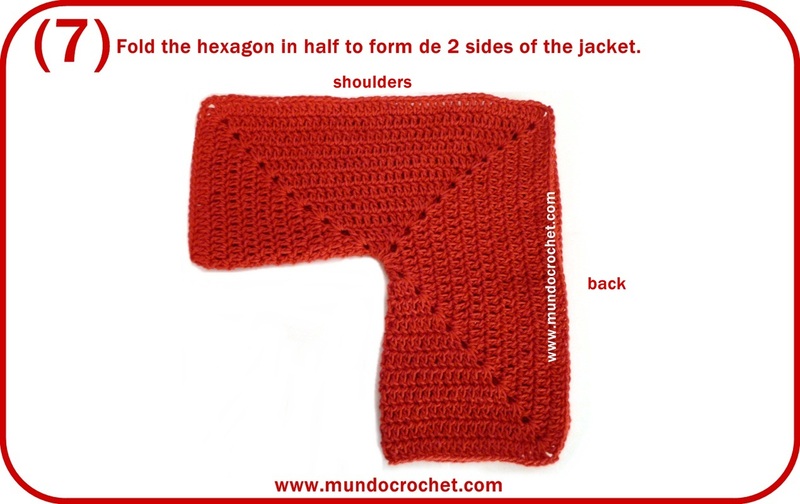 I will show you how, by changing 1 or 3 sides of the hexagon, we can change the shape of the jacket. Suppose that we want to modify the length of the jacket, the length of the sleeves, the width of the back or front leaving the rest unchanged. 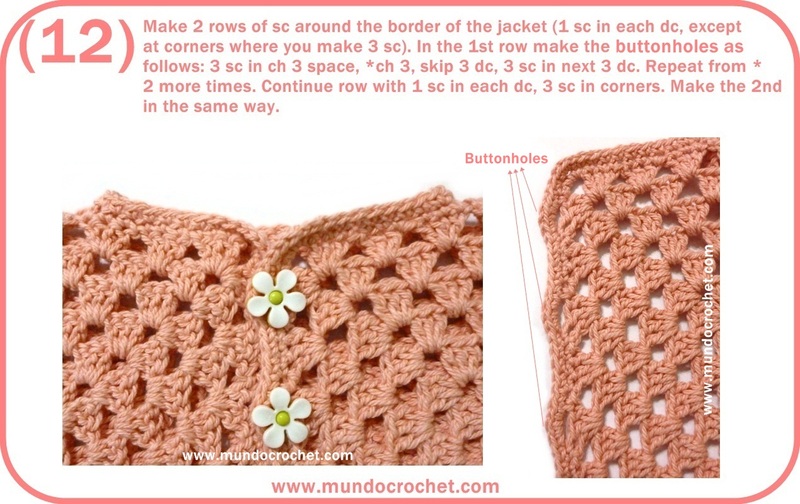 To do this you just have to modify one side of the jacket. 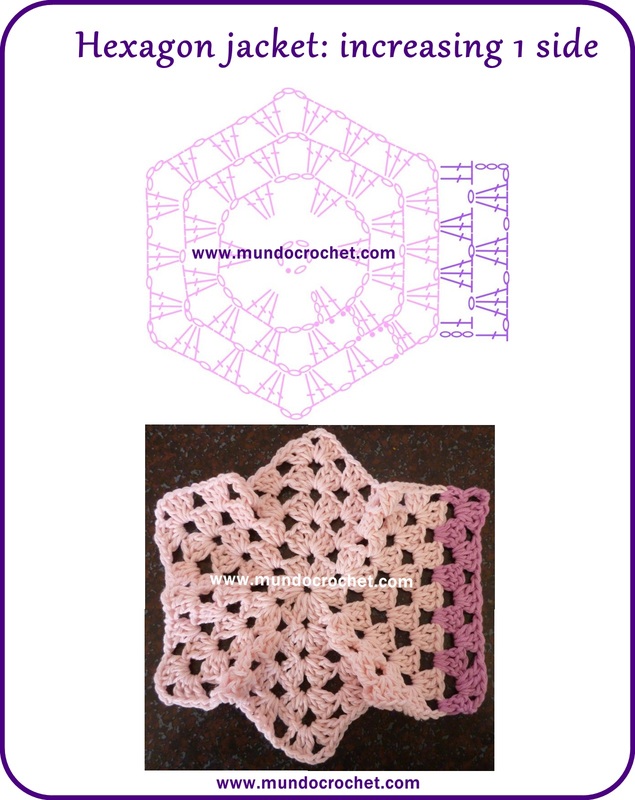 In the case that want to modify several sides at once, you just have to continue crocheting in 3 of the 6 sides of the hexagon. 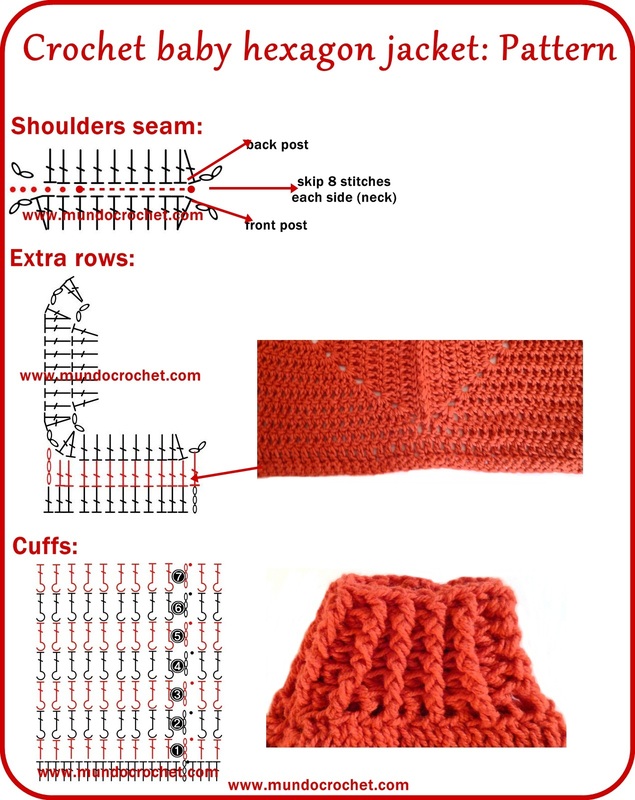 This way you can modify the front, back and length at the same time, or the shoulders and sleeves. 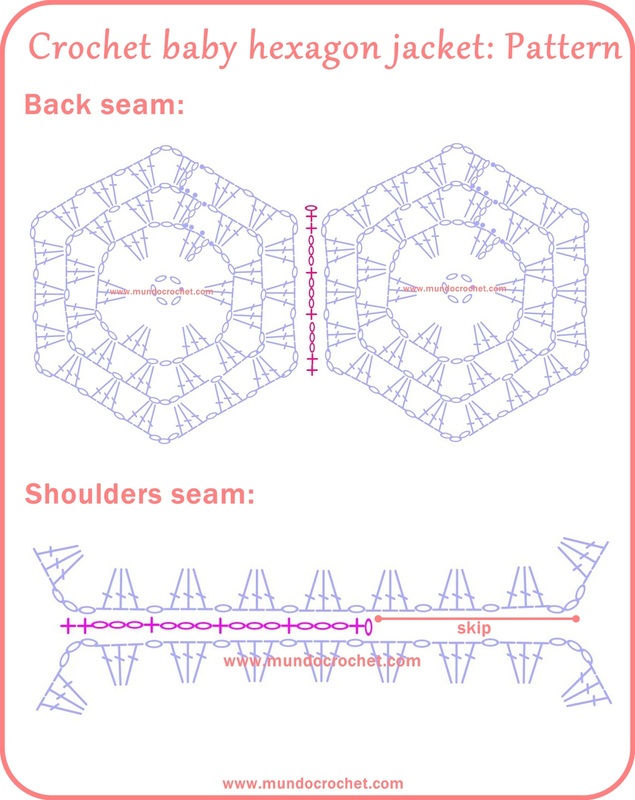 It depends on how you fold the hexagon to form the jacket. 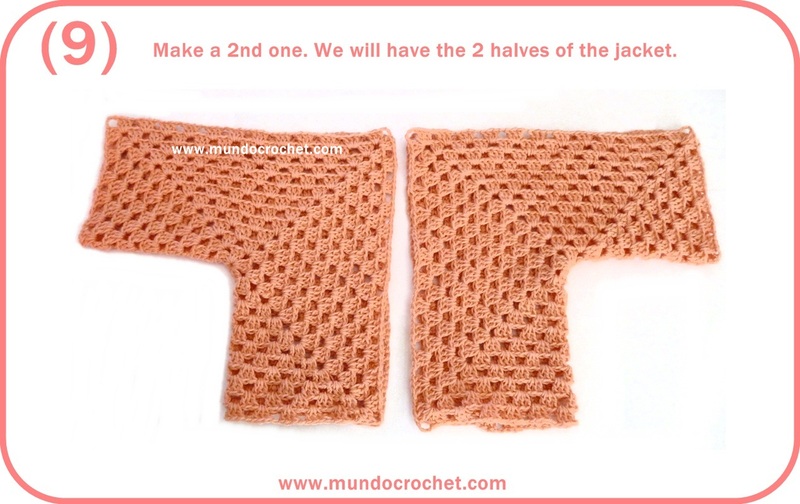 I hope you find this post clear and useful to crochet the jacket in all the sizes that you want. Here is the Spanish version of this post. 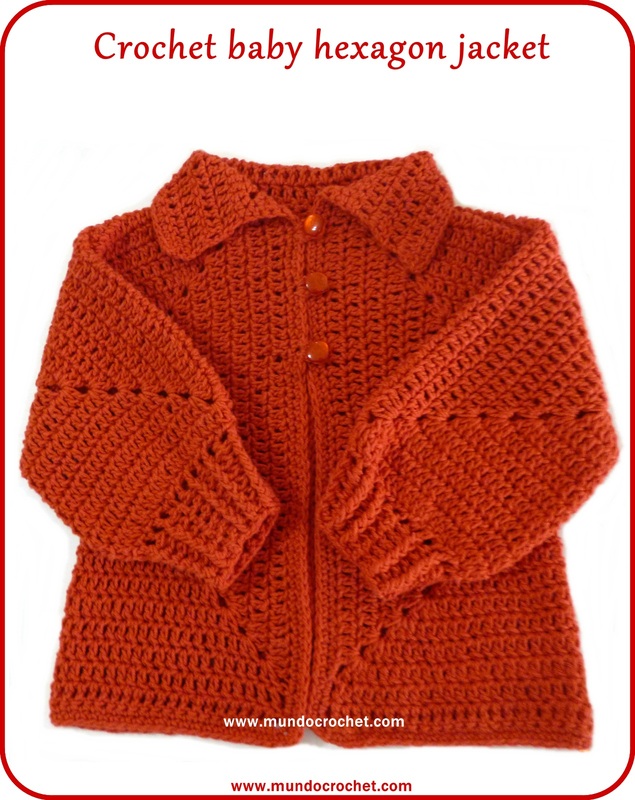 In this new post I want to bring you another version of the baby hexagon jacket. 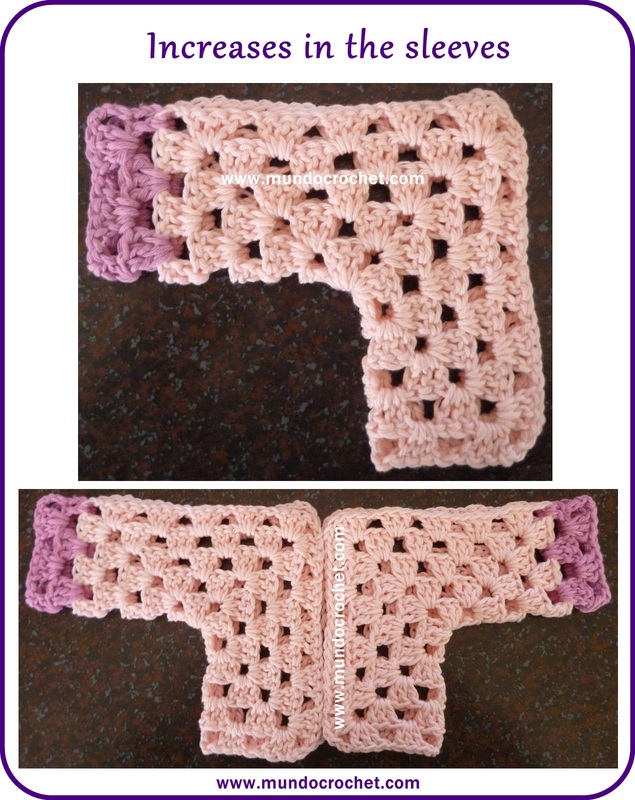 This version has no holes, wich makes it warmer and allows other colour combinations. This pattern, as the other version, is made with two hexagons that folded in half become the two halves of the jacket. Once the two halves are seamed together, we add the collar and cuffs. 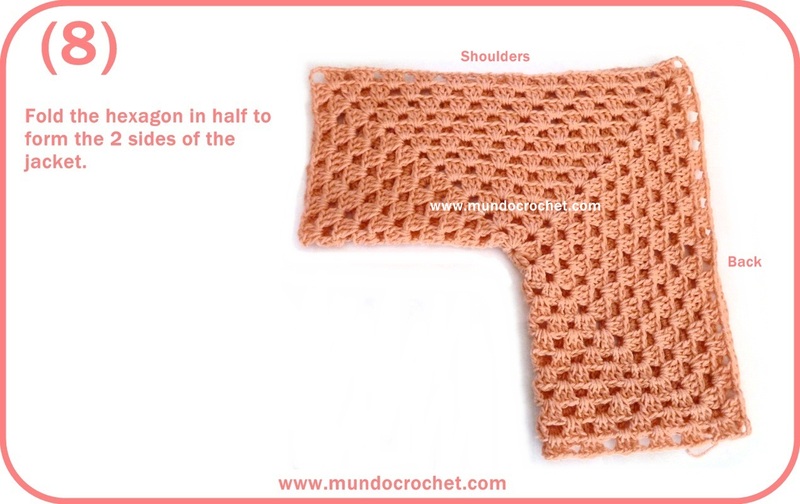 This pattern can be found on the web in several languages ​​as “saquito hexagonal o en hexágono”, “chompita hexagonal”, “chompa en hexágono”, “casaquinho hexágonos”, “hexagon jacket” or “hexagon sweater”. 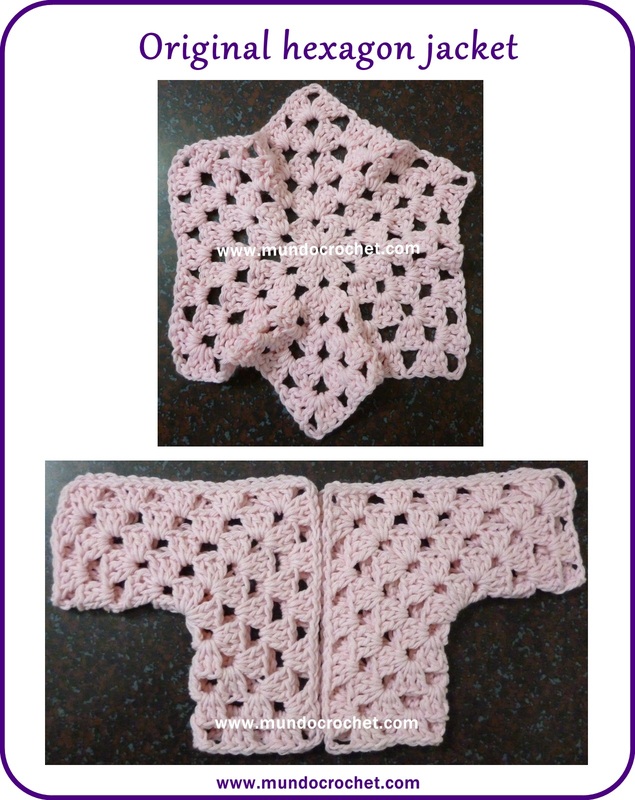 This version is inspired in the Sue’s Hexagon Baby Sweater from Cozy’s Corner. 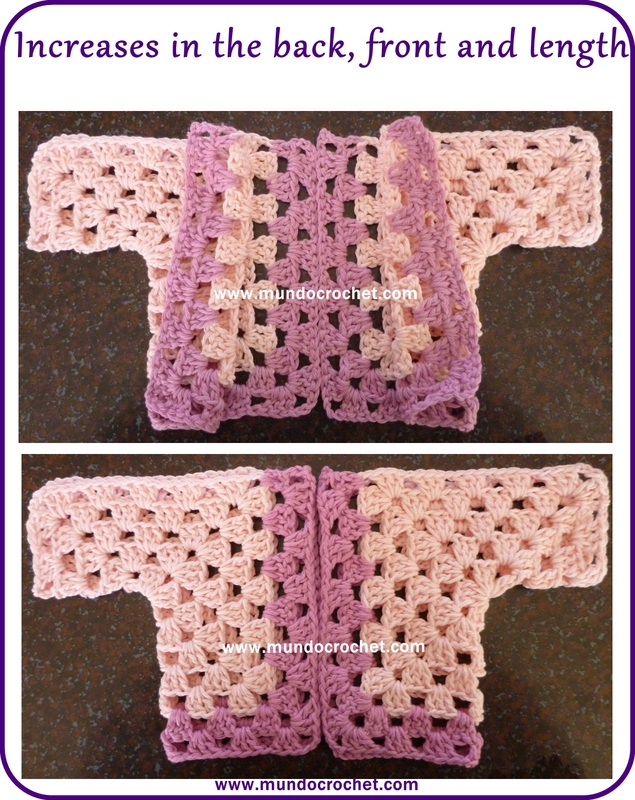 As most of the post of the blog, this is an ideal project for beginners and those who don’t like the idea of crocheting sleeves separately. 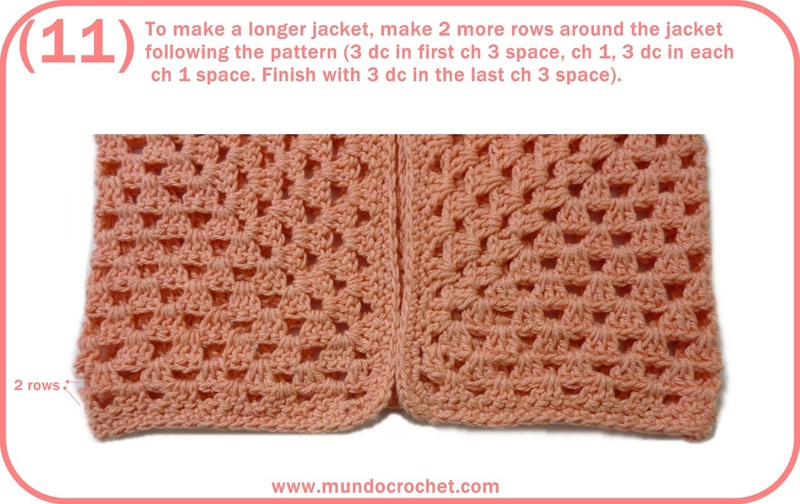 To increase the size of the jacket make bigger hexagons by adding rows. 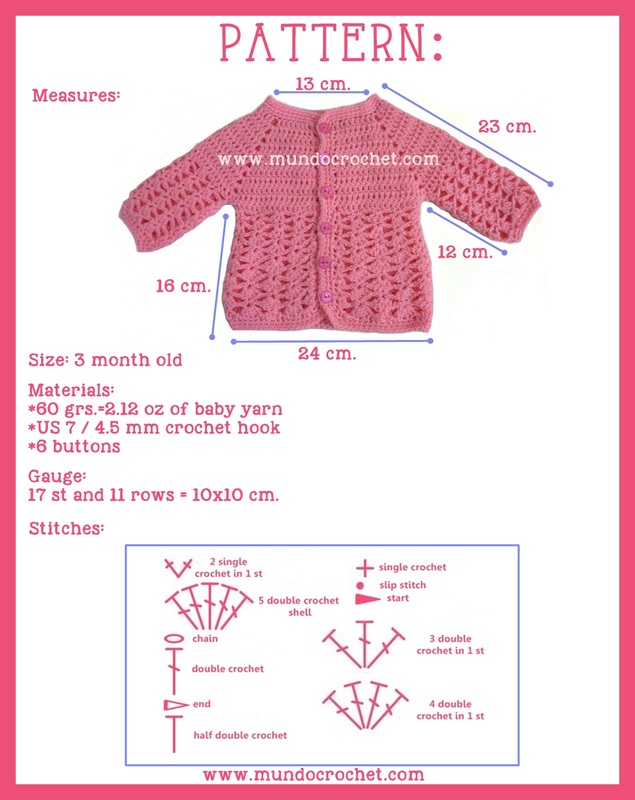 Here you can see how to change the size of the jacket. 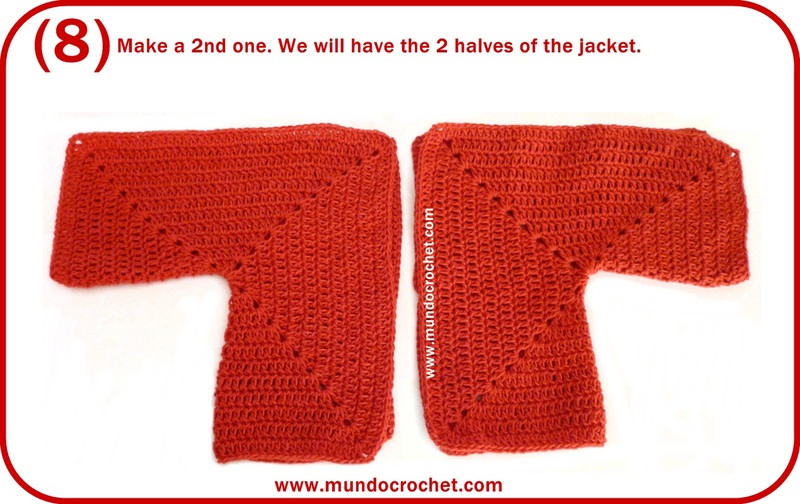 I hope you try the 2 versions of the jacket and share the pictures of your projects made using this pattern on the facebook page of Mundo Crochet!!! 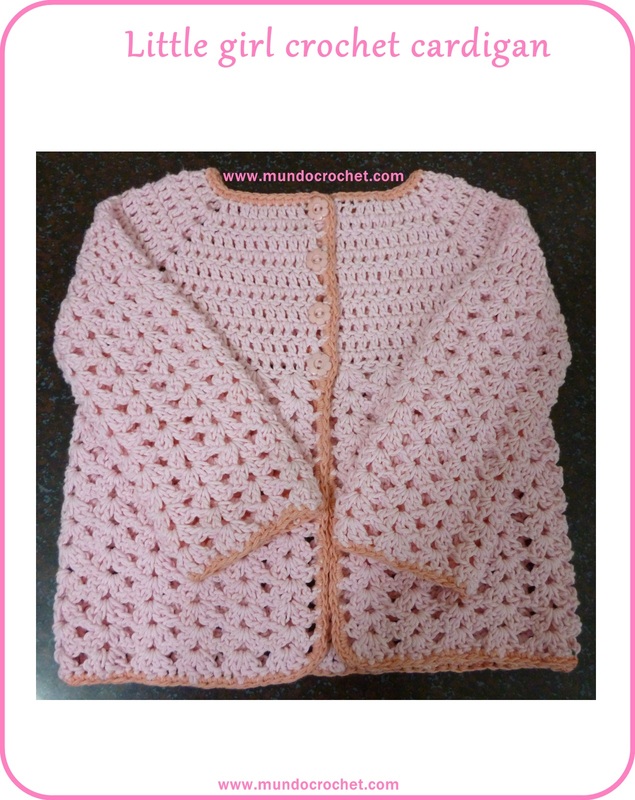 In this ocasion, I want to bring you the free crochet pattern and tutorial of this beautiful cardigan that I made for my little princess: my daughter Constanza. 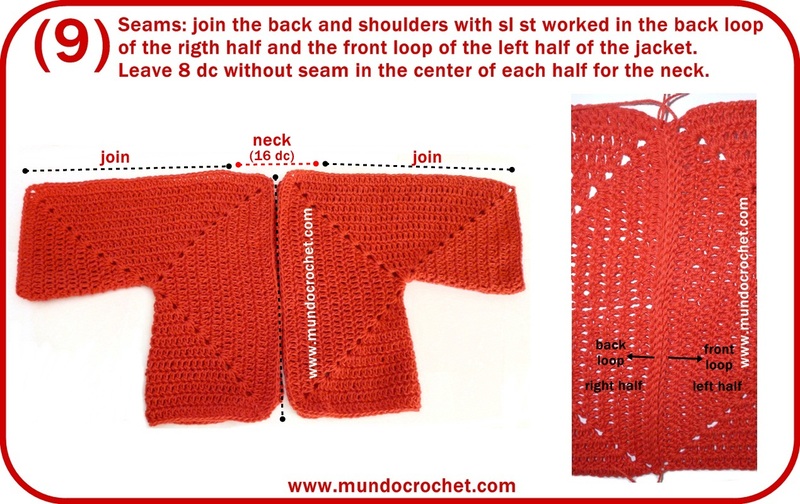 It’s a very simple pattern that begins with a yoke which is then divided in front, sleeves and back. The back and front are continued working on a stage and the sleeves in another. 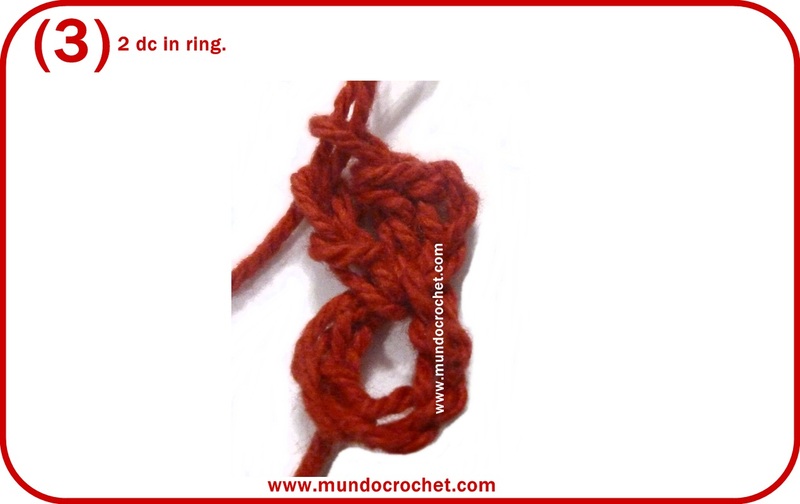 I hope that the tutorial make it easier for beginners to understand how to work in crochet when we start with a yoke. 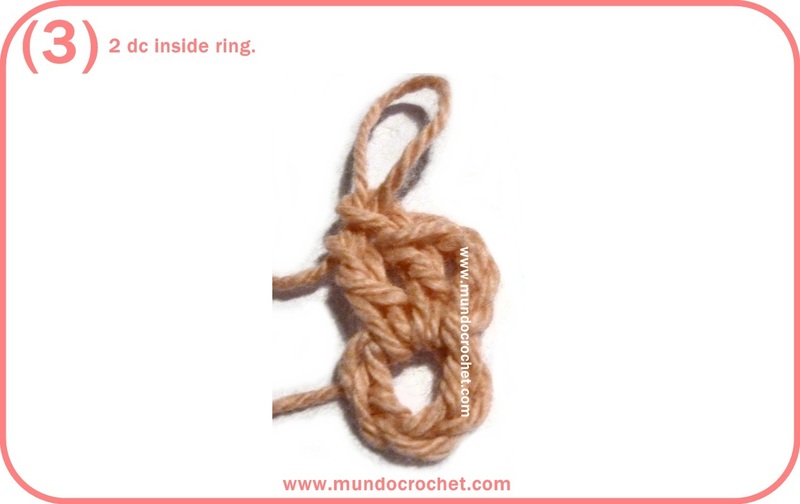 It is specially thought for them, who often manage to crochet the yoke, but then find it difficult the division in the different parts. To increase or decrease the size, you only have to change the number of chains of the yoke, always respecting the proportions of the original model. 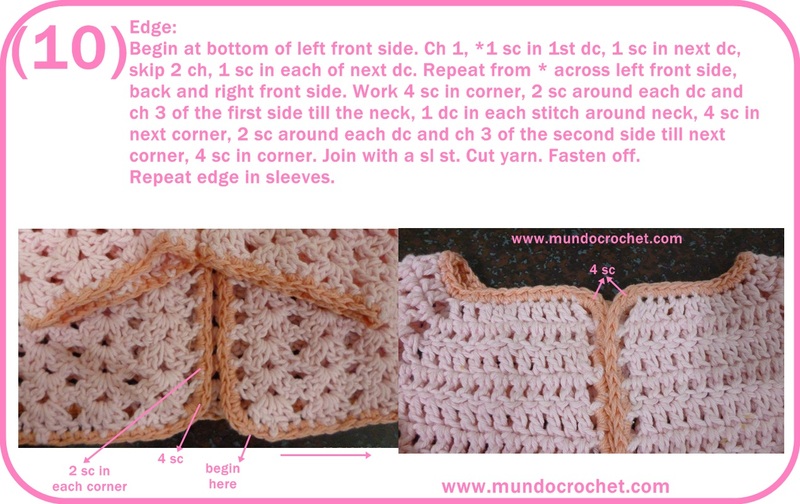 Please share the pictures of your projects made using this pattern on the facebook page of Mundo Crochet!!! 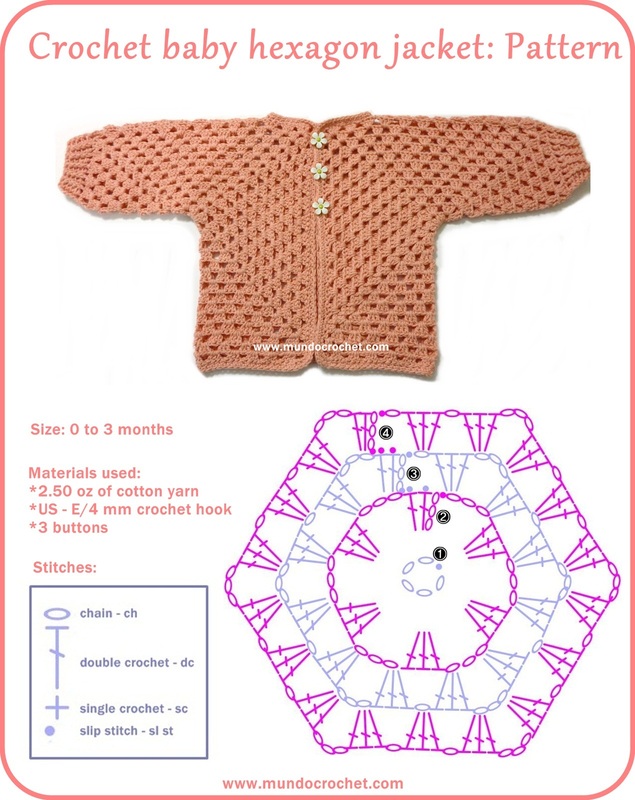 This time I want to bring you this free crochet pattern of the hexagon jacket that I made for my daughter Micaela who will be born in January of next year. This jacket is made with two hexagons that folded in half become the two halves of the jacket. Once the two halves are seamed together, we add the collar and cuffs. 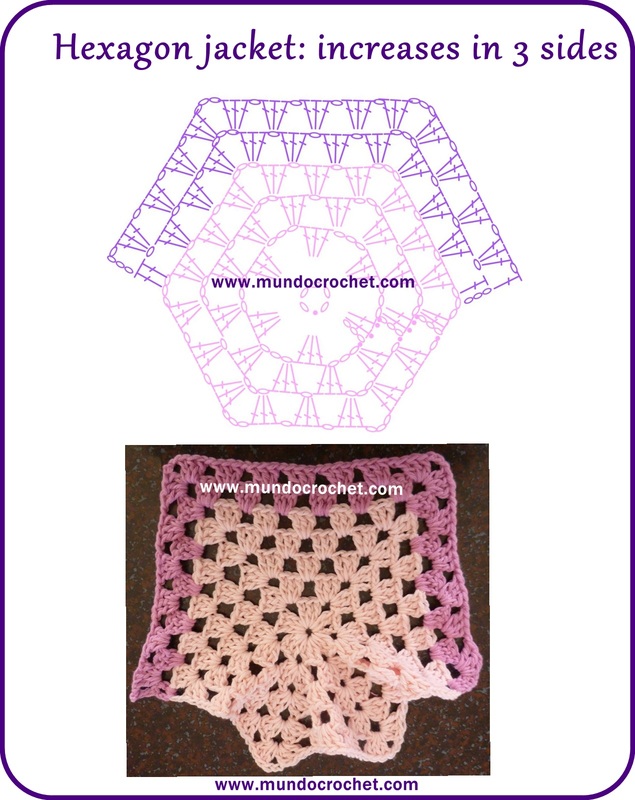 This pattern can be found on the web in several languages ​​as “saquito hexagonal o en hexágono”, “chompita hexagonal”, “chompa en hexágono”, “casaquinho hexágonos”, “hexagon jacket” or “hexagon sweater”. 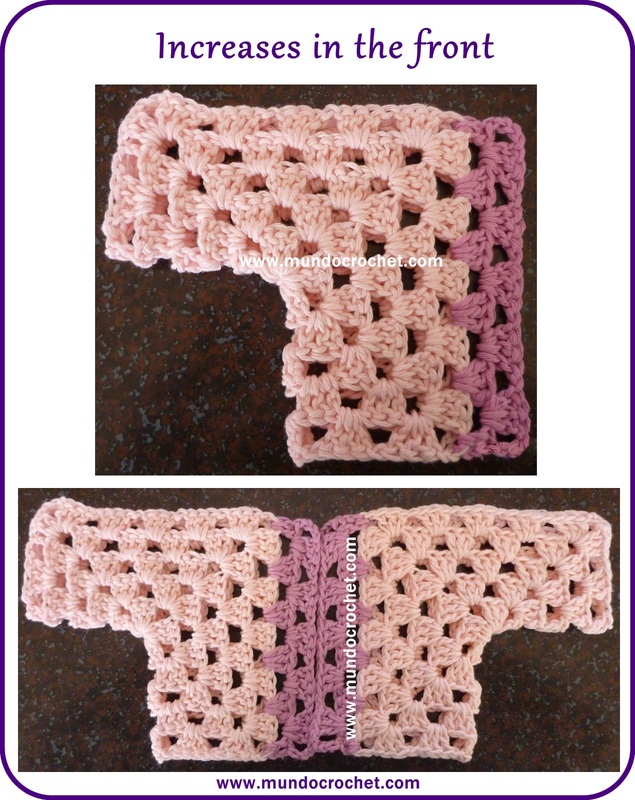 As you can see, this is a very popular pattern that allows you a lot of color combinations. 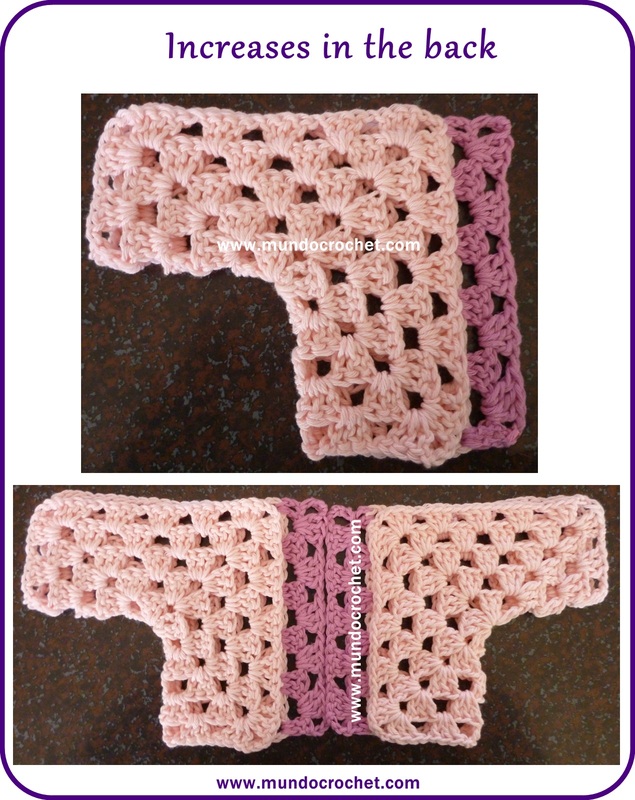 It is an ideal project for beginners and those who don’t like the idea of crocheting sleeves separately.